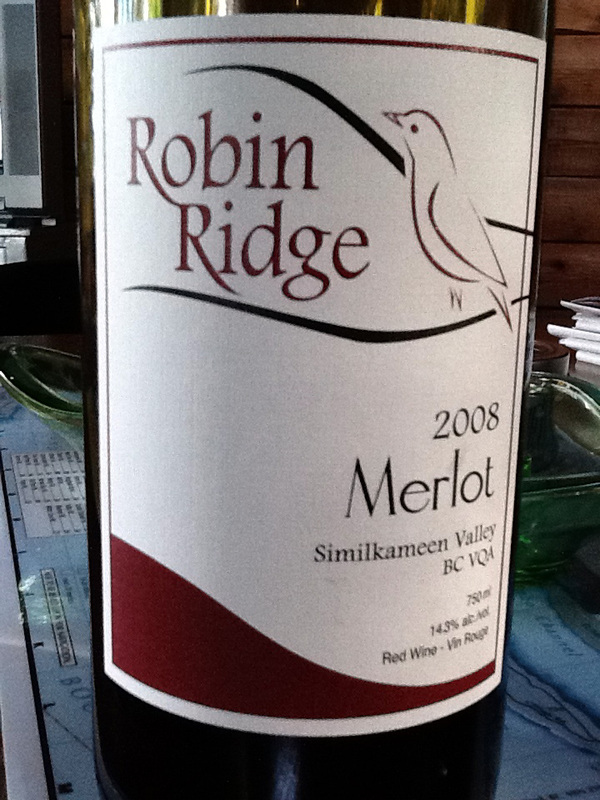 Price: $19.99 at Everything Wine or BC Liquor; $18.99 at EW with the case discount. Market Liquidity: Nice bottle to find chilled in the fridge. A friend recommended this blend (garnacha tintorera, monastrell) after buying it based on a “point” review (no names mentioned!). It is, I guess, the perfect wine for some people. Not for us. Price: $18.99 at Everything Wine ($18.04 with the case discount). Market Liquidity: Dan Savage says “it gets better.” Not always. We rounded out our Big Red Weekend with two cab sauvs. The Montes Alpha is an old standby, not hard to source, and easy going down. Since you can find it, usually, even in remote area liquor stores, it’s a great choice for BBQs and weekends when there’s nothing else but Yellow Tail and Piat Boring. But it doesn’t drink like a cab sauv; the flavour, yes I guess, but the body is soft and round and if it was a blind taste test I would think merlot blend. It sells for nearly $26 and at that price it’s always our first bottle, never our second, but this week it was three dollars off and not a bad wine at that price. 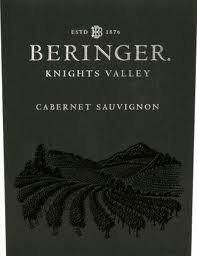 Our Sunday night dinner, however, was toasted with a hefty 2009 Beringer Kinghts Valley Cab Sauv. This has weight. Heady. Take no prisoners. It could use some rest. 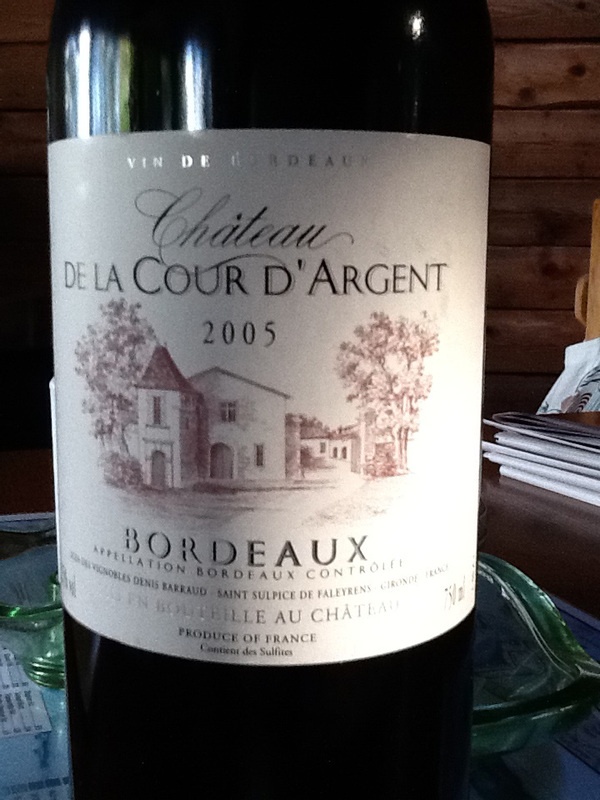 Unlike the Montes Alpha this is the real McCoy: Gorgeous depth, blackberry, black currant, some spice and mild tannins. A wonderful evenness if in the end just a little too heavy in 2011. 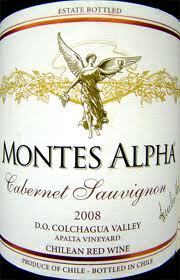 Price: BC Liquor sells the Montes Alpha regularly at $26; we got it for $23. BC Liquor sells the Beringer at a paralyzing $45 (!!!) but we picked up a bottle at Cost-Cutter in Washington for $22.49 USD. Market Liquidity: The Montes Alpha is a $20 bottle of wine with a $26 price tag; province-wide accessibility somewhat redeems the price tag. The Beringer is manna at $22 USD and a second-mortgage stretch at $45 CDN. This is a very nice wine. I say that without a hint of sarcasm. The only thing, it’s like a million other wines you might drink, at a wine bar, in a restaurant, at someone’s home. It’s nothing to really write much of a review about. It’s like getting prompt service from a teller at the bank; it’s a drag to have to do a transaction other than at the ATM but it’s convenient you don’t have to wait too long. I swear if you blindfolded me and gave me a taste I wouldn’t have the slightest clue what I was drinking. But, as I say, not unpleasant, just non-descript. 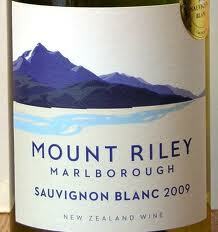 We bought it at MudBay wines, a rather wonderful local wine store, well stocked, reasonable prices. BC wines only; a strength and a weakness. Price: $20 at MudBay, on sale, regularly (I think) $22. Market Liquidity: In a sea of wine temptation not our first pick. Scored a bottle of Teira 2005 Sonoma Zinfandel on sale at BC Liquor. Which is to say, stumbled across the sale sign in the California wine section, saw that all the wine was sold out, then saw one last bottle on a different rack mis-shelved with another blend. Which is also to say that you never know what’s on sale at the government liquor store. Unlike, say, Kitsilano and Everything Wine, which regularly run print ads, and unlike Marquis which has weekly specials and an electronic newsletter, and unlike just about every other business in the world capitalist system that lets customers know about sales and discounts and offers, BC Liquor is too—what? faux-ethical? nanny-ish? self-absorbed? old-school? out-of-touch?, all of the above to really understand that the billions they make in profit each year (yes, that’s right, billions) come from customers. Sales come and go, you stumble across them in individual stores, if you’re lucky. Of course BCL will advertise widely telling you how important it is to support their stores, what an integral piece of the provincial economy they are, and how many people they employ, bla bla bla, but customer service? Not on their radar. OK, rant aside, this was a great find. Retails for around $33 at Everything Wine and when it was at BCL was $28, so scoring it at $24 was vino-tacular. Tasty? Oh God was this easy to drink. Unlike the Spanish reds we had last week this was the sort of wine you could spend hours at a party wandering around enjoying on its own, with snacks or food or, yes, just more on its own. This is a no food required red. Oak, vanilla, currant, maraschino cherry juice. Just the right amount of “red wine bite.” Sits on the palate perfectly, begging to be enjoyed. Price: Gone from BCL. But on sale was $24, reg $28. I don’t like to drink this wine. On its own I mean. Stand alone it has an unpleasant chalky tannic quality on the palate, it just isn’t the Pinot you expect from, say, Oregon or the Northwest, it doesn’t make you want to pour another glass. But with Food? Ooh la la! With food LVP Adieu has just the right amount of cherry, a predominance of cherry to start, and then some oak, vanilla and spice. As we ploughed through the case I experimented with different foods and found that, simply, this wine was a marriage with lamb; braised shanks, roast leg, chops, you name it. Kudos, too, for 13.5% alcohol. Here is the nagging detail: LBP is a bit like that kid in high school a little full of himself who you know, in the real world, is just going to be another suit-and-tie-john. 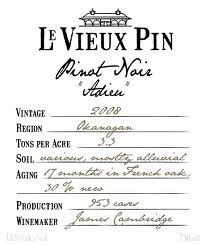 This wine sells for a few bucks more than I like to spend—and it’s not even close to their top end, but if you had the dough and lined up not the best CA, OR and BC have to offer, but some of their “better” pinot noir vintages, some of their above-average pinots, I would hazard LVP wouldn’t even be in the top ten. If you’ve ever travelled through Oregon and sampled the wares you’ll know what I mean. This wine is very good. Thanks. 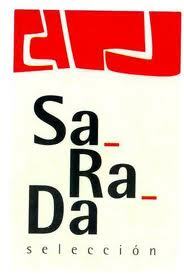 But it’s not the errata in Sideways, if you will. Price: $35 from the vineyard, plus shipping, no case discount. Market Liquidity: A glass at Jean-Georges’ Market will suffice. Stunningly Refreshing. Green. Green, green. Sharp, penetrating citrus and floral notes. Very long finish. Poy fekt Nu Wrld Sove Blank. We found this wine didn’t open up at room temperature the way many whites do; rather, “fridge” cold it had a zingier nearly effervescent tang and went down a treat. So, if there’s a strike against it, this is no lingering sipper, the way so many chards and rieslings are. But who cares? This “value” offering from the prestigious Loosen house is a very masculine riesling. It is dry, as in dry dry, strong flavours of apple, a little citric acid touch on the finish, but solid as a rock. My sister recommended it to me, she usually drinks red, and perhaps she liked it so much because it was a white wine in red wine clothes. We had it one night with braised leeks in a light vinaigrette, and the next with fresh wild mushroom risotto. It was better with the risotto, which surprised me. (If you don’t know Louie at the Granville Island Market—Thursdays, generally, until he sells out—he has the best mushrooms in the province.) A pleasant 11.5% alcohol. If you expect a delicate touch in your riesling, some Fonteyn-balletic spring, this is not the wine for you. This is a tango. I liked it enough to source out more bottles (no mean feat in the ridiculous BC wine world, especially as this wine received a triple blow: A good review from Gismondi, a good review from Jurgen Gothe, and priced, initially, under $20. Like a kiss of death in BC…) and I would serve it to guests, although if I had to pick I think the more delicate, diverse rieslings, like the Doctors from New Zealand, also reviewed here, are my preference. But they may be probably less to the general taste. 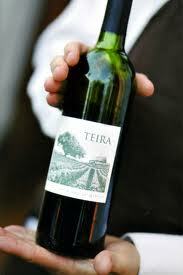 Market Liquidity: When you need a woman to do a man’s job, this is the wine.